When the City of Richmond was incorporated in May of 1837, the citizens did not have an organized fire service. Nearly every able-bodied man in the community participated in fire extinguishment. It was not until July 26, 1897 that the first organized fire protection was provided by a group of individuals, led by Foreman J.K. Carr, and referred to them as the Pioneer Hose Company No.1. On February 14, 1898, the Pioneer Hose Company No.1 was reorganized and officially named the Phoenix Hose Company No.1, of Richmond, Texas. The restructured company was comprised of 22 volunteers, mostly prevalent businessmen, who were required to pay regular monthly dues of 25 cents. The first foreman for the company was E.F. Gillman. For fire protection, the company used one large hose cart drawn by hand. Water for fire fighting was secured from underground cisterns, except for the business district, which was supplied by fire hydrants. 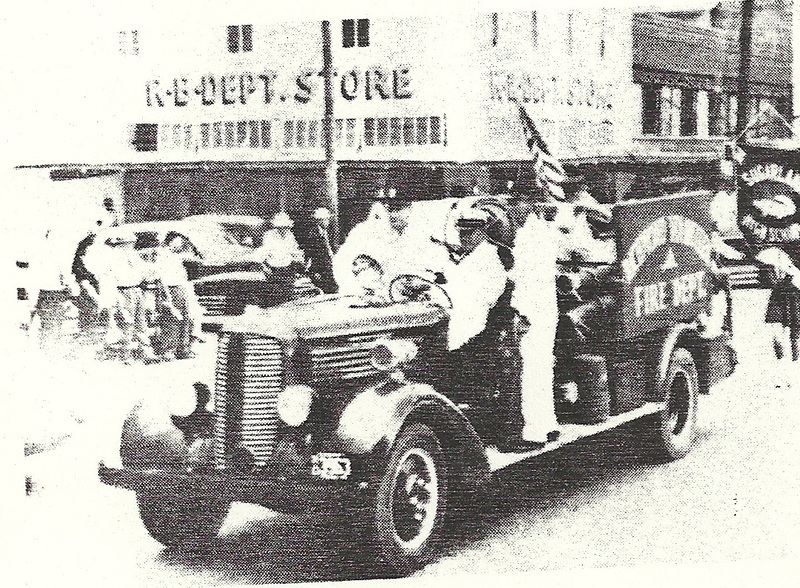 In 1924 the Richmond Volunteer Fire Department was created through a reorganization of the already established Phoenix Hose Company No.1, of Richmond, Texas. 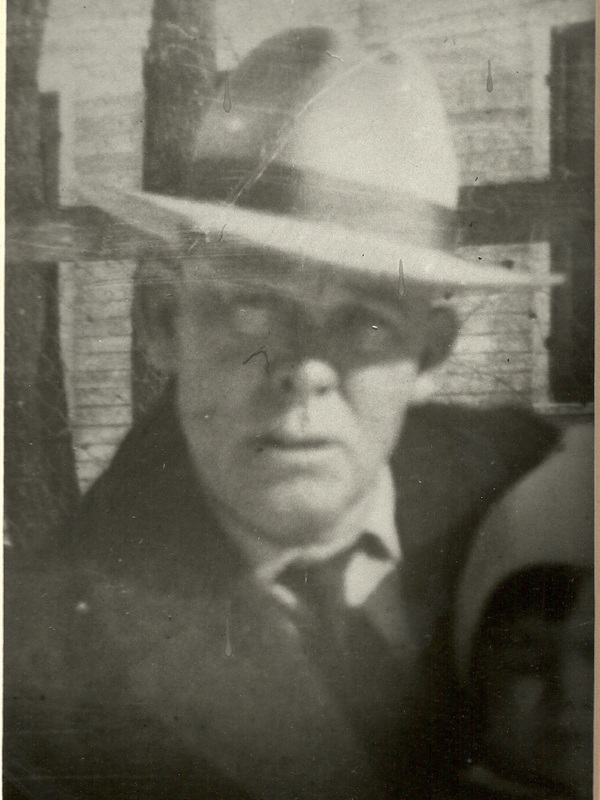 The members of the new department appointed Walter H. Hinson the first fire chief. T. B. Wessendorff, then mayor, gave the appointment the official stamp of approval by buying Hinson a fire chief’s hat. In 1925 Richmond purchased its first piece of motorized equipment, a Model "T" Ford fire truck for approximately $2,000, known as "Old Tin sides". The new truck was shipped on August 20th of the same year. "Old Tin sides" was given the name No.1 and was equipped with all standard equipment, including a 50 gallon booster tank. Years later in 1935, Richmond installed a modern water system and Sam Nordhausen was promoted from Captain to Fire Chief. In 1937, a homeowner complained to the city commission when a fire destroyed their home causing thousands of dollars in damage. 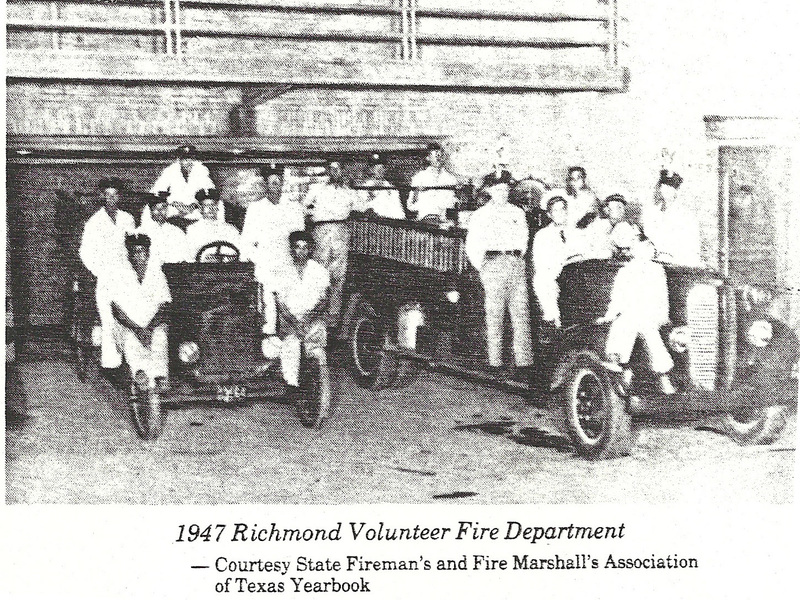 On February 9, 1937, Richmond Volunteer Fire Department was reorganized, resulting in a more defined membership of volunteers. During the reorganization, the city commission, led by Mayor G.D. Birdwell, declared and designated that the Richmond Volunteer Fire Department as the duly authorized fire department for the City of Richmond, Texas. Membership of the redesigned department was limited to twenty men of at least 21 years of age. The reorganization of the department, also led to the city purchasing a 1937 Dodge Fire Truck for $4,236 from Buffalo Fire Apparatus, based in Buffalo, NY. This pumper was delivered on September 14, 1937 and was quickly recognized as No. 2. The new vehicle was equipped with a 100 gallon booster tank. This improved the ability of the fire department to provide fire protection and lowered the community insurance rates greatly. Under Mayor John M. Moore a city hall/fire station was built in 1940. The new building was constructed at 402 Morton Street and is presently used as Richmond City Hall. In 1943 E.O. Bender was voted Fire Chief, a position he would hold for 13 years. He saw the purchase of the department’s next fire truck, another Dodge Pumper, purchased in 1951. This truck, known as No. 3, allowed the department to retire its first truck, the Ford Model-T, since insurance regulations required the city to keep two fire trucks maintained. 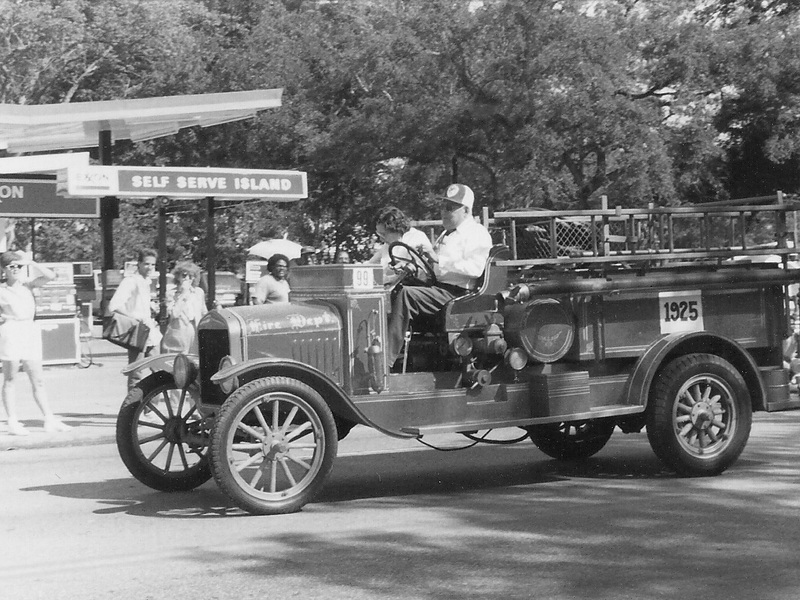 Due to the new fire apparatus, the fire department was able to sell the Ford Model-T in the early 1950s. It was not until the mid to late 1970s that the department was able to reacquire the vehicle from a private collector in Woodville, Texas for $2,500. Upon E. O. Bender’s departure as fire chief, Milford Gless was called upon to take the position in 1956. During his tenure the city saw the purchase of a tank truck, referred as No.4 in 1963. This was the first of Richmond’s fleet to carry 1000 gallons of water. This would help immensely in rural firefighting where water is not readily available. This was followed shortly by moving into a new building housing both police and fire departments, in 1964. This building had four bays, offices and a jail cell. This building was later renovated, in 1974, to have seven bays, a meeting room and a dispatch center. In 1986, the police department moved to a new location, giving the fire department its own building and room to expand. This is the same building presently being used as Station 1 at the corner of Jackson St and South 2nd St. In 1967 Keith Crawford took over as Fire Chief. He led the department to the purchase of two pumpers, No. 5 in 1968 and No. 6 in 1974. In 1973, Homer Sharp was hired as the station attendant to keep the stations and trucks operable. In October 1974, the first two paid firemen were hired to staff the station through separate eight hour shifts during the day. On November 13, 1975, No. 4 was involved in a rollover accident at the intersection in front of the fire station. Though the truck was a total loss, nobody was seriously injured. 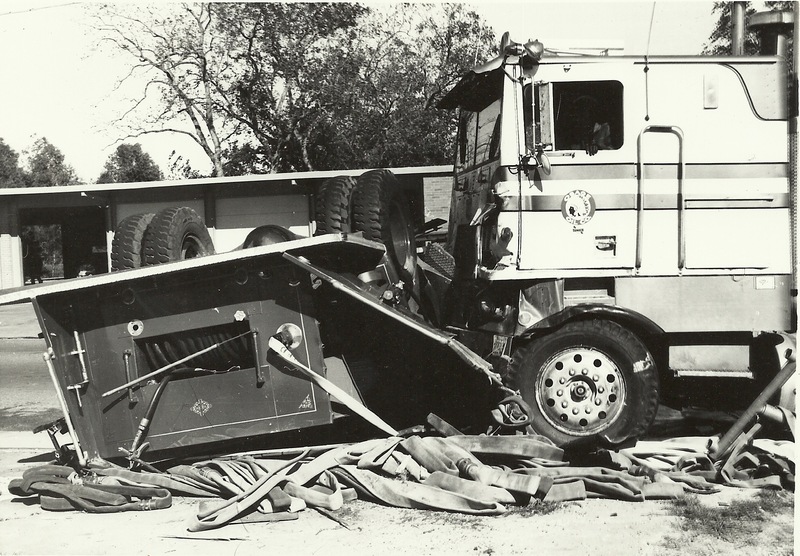 To replace this truck, a new tank truck was purchased in 1976, known today as Tanker 4. 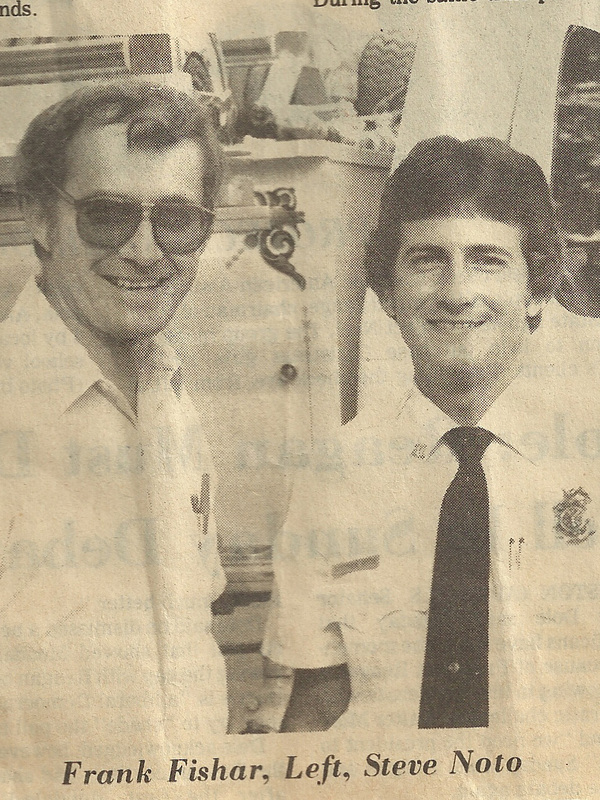 In early 1977 Bobby Fishbeck was named Fire Chief and held the position for almost 2 years and was later replaced by Frank Fishar in late 1978. During his first few years, more firefighters were hired bringing the total to six. With the hiring of six full-time firefighters and establishing 3 24 hour shifts, the fire department began to take shape of what the department would be for the next several decades. The contributions made by these six earned them the designation as the ‘Original Six’. In 1984 Stephen Noto was appointed as Fire Chief, a position he would hold for 26 years. In the following years the department grew to 37 full time employees including firefighters, arson investigators, inspectors, and administration staff. Richmond would see the addition of two fire stations the latest being built in 2008. Also in 2008 the first aerial apparatus on the west side of Fort Bend County was added to the Richmond Fire Department. With the retirement of Chief Noto in 2011, Michael Youngblood, was appointed to continue to lead the department into a new age. With Chief Youngblood, more positions for firefighters, inspectors, and permit specialists were added, along with overseeing the opening of the new Fire Department Headquarters located at 200 Houston Street in January of 2016. The Richmond Fire Department is committed to maintaining a high regard for customer service through its growth and is well known for its activity within the community and the service area. As the Richmond Fire Department moves to the future, customer and community service will continue to be a fundamental principle and serve as the foundation for the department.